This page is devoted to thought proving articles that are eye-opener for all God loving people. We do not intend to criticize any organization or individual or a group of individuals. Our object is to give serious thoughts to something that is not biblically correct. A good athlete gets rid of all unnecessary weight when he sets on the track In the same way, when we plan to follow the “narrow path”, we need to get rid of unnecessary things that occupy us because sometimes blessings can blur our spiritual vision and make eternal values un-important. A boy went into a pet shop, looking for a puppy. The store owner showed him a litter in a box. The boy looked at the puppies. He picked each one up, examined it, and put it back into the box. After several minutes, he walked back to the owner and said, "I picked one out. How much will it cost?" The man gave him the price, and the boy promised to be back in a few days with the money. "Don't take too long," the owner cautioned. "Puppies like these sell quickly." The boy turned and smiled knowingly, "I'm not worried," he said. "Mine will still be here." The boy went to work—weeding, washing windows, cleaning yards. He worked hard and saved his money. When he had enough for the puppy, he returned to the store. He walked up to the counter and laid down a pocketful of wadded bills. The store owner sorted and counted the cash. After verifying the amount, he smiled at the boy and said, "All right, son, you can go get your puppy." The boy reached into the back of the box, pulled out a skinny dog with a limp leg, and started to leave. "Don't take that puppy," he objected. "He's crippled. He can't play. He'll never run with you. He can't fetch. Get one of the healthy pups." "No thank you, sir" the boy replied. "This is exactly the kind of dog I've been looking for." As the boy turned to leave, the store owner started to speak but remained silent. Suddenly he understood. For extending from the bottom of the boy's trousers was a brace—a brace for his crippled leg. 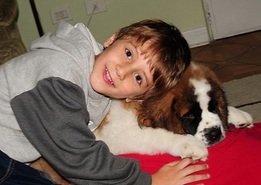 Why did the boy want the dog? Because he knew how it felt. And he knew it was very special. What did Jesus know that enabled him to do what he did? He knew how the people felt, and he knew that they were special. I hope you never forget that. Jesus knows how you feel. You're under the gun at work? Jesus knows how you feel. You've got more to do than is humanly possible? So did he. You've got children who make a "piranha hour" out of your dinner hour? Jesus knows what that's like. People take more from you than they give? Jesus understands. Your teenagers won't listen? Your students won't try? Your employees give you blank stares when you assign tasks? Believe me, friend, Jesus knows how you feel. You are precious to him. So precious that he became like you so that you would come to him. And, like the boy, he paid a great price to take you home.